I do not have cable. I don't even own a television. The only way Jessi and I watch something is on our computers. The only two services we really depend on are Netflix and Hulu. Netflix continues to be amazing. I pay $9 a month to get 1 DVD at a time plus unlimited online streaming. Over time, their library has been expanding and so have the devices I can watch on - all of it commercial free. Netflix is awesome, and probably part of the reason why I'm suddenly leery of Hulu. We use Hulu to watch are favorite TV shows (Chuck, The Office, and Bones). When we first started, we technically didn't have commercials. 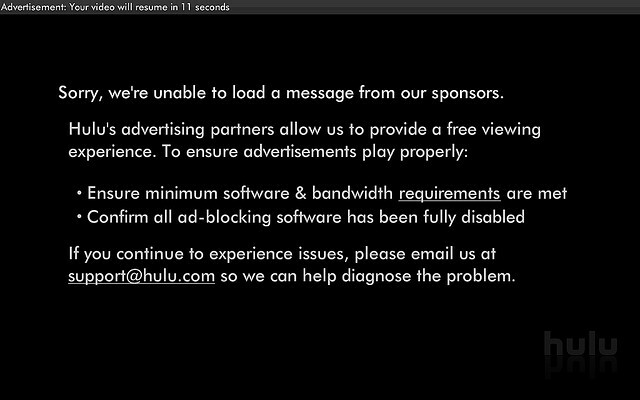 We would get a black screen saying Hulu couldn't load a message from their sponsors (just like the picture). It was great! A 15-30 second break to take a pause and then right back to the show. Eventually, Hulu figured out their problem and began successfully showing commercials. It still wasn't too bad because it was still only a single 15-30 second commercial and the cost was free. However, the start of this fall things changed. Now Hulu shows 2 commercials where each range from 30 seconds, to one that was 1 minute, 15 seconds. Furthermore, if you want to watch Hulu on anything other than your computer's browser, it'll cost you $10 per month - commercials still included. I can clearly see where this is headed. I can easily imagine a day where Hulu is making me sit through 3 to 4 minutes of commercials and still charging me $10 per month for that privilege - even for 1st run shows. Since I only watch these 3 shows, the math starts to break down. $2/show on iTunes * 22 episodes * 3 Shows = $132 per year. That's only $1 more per month - which I can watch on any device I own and has no commercials. If I'm really patient, I can wait until the DVDs come out and watch them on Netflix for no additional cost. I suppose another solution is to stop watching TV all together and then I really don't care about what Hulu does, but that doesn't seem to be an immediate option. If I worked for Hulu, my advice would be to cut the monthly price to $8 per month and cut the commercials back down to a minimum (with sometimes no commercials. Pandora does this. A company will pay to NOT play audio, but just display an ad while the next song plays.). If I worked for Netflix, my advice would be to figure out how to get streaming TV shows as they're happening, or at most 1 week after they air. I would even pay another $2 per month if they offered my 3 shows that way. If they did that, I would switch fully over to Netflix for all my TV shows and movies. Maybe I'm coming to conclusions too soon, but in my opinion Hulu is headed down a negative track. If this continues, I'll be on the look out for a replacement, even if the video quality isn't as good.